Listen…the cancer industry has been doing “research” for over 50 years. Yet, the incidence of cancer in Americans today is close to 1 in 2 people. Do you think the research is working? 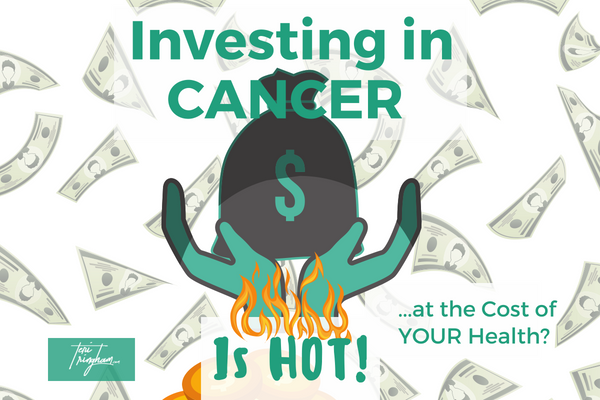 If you want a place to invest with guaranteed good return on your $’s, invest in cancer treatments and research. If you want guaranteed long term negative health ramifications and a poor success rate for you and yours, invest in using cancer treatments and research. Sadly, articles such as The Economists are a summary of why the cancer industry is a great place to invest, where to invest and why. Isn’t it sad that peoples health and lives come down to dollars? While there’s no question, it takes money to run any business, funneling money into research that produces dismal results but capitalizes on peoples hopes is an age old practice that appeals to hope for a cure. Yet…no cure has still been produced. Using our investment funds for cancer “research” unfortunately comes down to supporting one of the most evil industries that has ever existed. Because, their focus is only in chemical treatments (they surely are chemicals, no matter how they label them) for the sick and dying rather than focus for root cause or for using natural –unaltered–constituents that work with the human body. Wheres the latest miracle treatment? Each year, even as far back as I was a teenager (a LONG time ago), the cancer and pharmaceutical industry would release publicity statements hailing the latest “miracle” cancer treatment and/or research for that year. And the media would go to town with blazing articles on the latest miracle treatment. Let’s see…we are 48 years later from when I first started seeing these articles and…oops…cancer has only escalated in occurrences with the miracle “treatments” success as dismal as ever. It doesn’t take a rocket scientist to figure out our research should focus on the CAUSE of cancer every bit as much-and more-than the chemical treatments. But…focus on preventing cancer would make a dent in the billion dollar industry called cancer treatment and research. See the problem? If you aren’t taking control of your health, your health will be in the hands of these highly degreed scientists and doctors who are focusing where the money is rather than the proven results alternative health can bring. Their focus remains on the same medical philosophy for treatment (chemicals/drugs/removing body parts) with the same dismal results. Even though there has been tremendous benefits known to come from minerals, supplements and plants such as Cannabis and its byproducts, no money is funneled into this area. Why? Because you cannot patent a plant or natural product unless its altered from its natural state. And, you can bet, if and when the pharmaceuticals tentacles are ever loosened in this area, they will be first on board to start producing an altered form of CBD oil. Meanwhile, while we obviously can’t make claims for cancer healing with CBD oil (since the money won’t funnel in that area), we do know a pure, high quality CBD oil that does not have THC (meaning no “high) can offer fabulous support to the human body. There are a multitude of alternative health options that have shown (often miraculous) results the cancer industry could absolutely use in their research for prevention of cancer. But they won’t look in this direction. Hence, the reason it’s been over eight years (thank the Lord) since I entered a doctors office. For an emergency, alleluia. Give me the emergency room (for the shortest period of time possible) and I’ll be thankful for their ability to help me. For prevention of health issues and chronic health conditions, I’ll let my own research prevail over the ones placing their research square in the money arena. Lack of interaction and trusts boosts the need for medical “attention”? We live in a world that has little personal interaction and touch. My belief is many people like their yearly medical Wellness check because attention is focused directly on them. Of course, once they are there, you can bet they will be testing (more attention) to look for problems that will lead to drugs for “helping” with these problems. I also believe the medical system is designed to capitalize on this need for humans to want attention by constant reminders to get in for your next appt and “Wellness check”. The human body is one that will always show some type of imbalance. Even on healthy people. Because the human body is constantly changing. One month we eat too much sugar, one month we follow most of the rules for good eating. At a cellular and blood testing level, the results of these habits will be reflected. Test if you want. But use that test to say “even though doctors tell me my cholesterol is high and recommend a cholesterol drug as well as avoiding saturated fats, my research shows saturated fats reduce inflammation-the main cause of high cholesterol. Hence, I will change my eating to avoid sugar/dairy/gluten- other big inflammatory items and use saturated fats”. Meanwhile, I pay to get these tests myself since I am not willing to sit in an office that will emphatically push drugs on me if my cholesterol is a bit over “normal” (with normal being the range pharmaceutical companies deem it to be). And…while I’m there, let’s push the latest flu/pneumonia/shingles vaccination. For chronic conditions and preventing cancer, let’s look at the odds of treating ourselves. While it may be frightening to “jump off the fence” from relying on a medical system centered around drugs to using your own intelligence and research to figure out what our body needs, it’s even more frightening to look at the odds of the medical system healing you. In fact, check every single drug insert in your home. Not one of them (I guarantee it) has the word healing on it. It does, however have a very scary list of side effects. Because drugs and the human body really don’t like each other. Ergo…side effects when the human body is forced to act in a way it was not designed to act. WHO will stop the madness? We can rely on an industry that has received billions and billions and BILLIONS of dollars to “cure” us or…we can stop contributing to a sick system by learning the things that cause cancer in the first place. Learn the causes, and remove them from your environment. We have the power to work with our body to do all we can to prevent cancer and disease. The choice, of course, is ours. Obviously, based on the money pouring into the medical system, we have great room for improvement in each of us looking it root cause to avoid cancer. Wouldn’t it be nice if each of us did exactly that? Wouldn’t it be nice if we chose to look at root cause instead of following the standard American diet down the rathole of cancer and disease? What if our investors and medical system put focus on working to have our government ban the chemicals in foods and personal care products. What if we started training each person the value of pure, whole foods and avoiding chemicals beginning in elementary school? Then perhaps, as the money stops pouring into the drug industry, the money might pour into alternative health research. Now…wouldn’t that be a (very) worthy investment? Do you believe in alternative health for helping with cancer avoidance or treatment? Comment below!